Okay, where did we leave off? That's right! 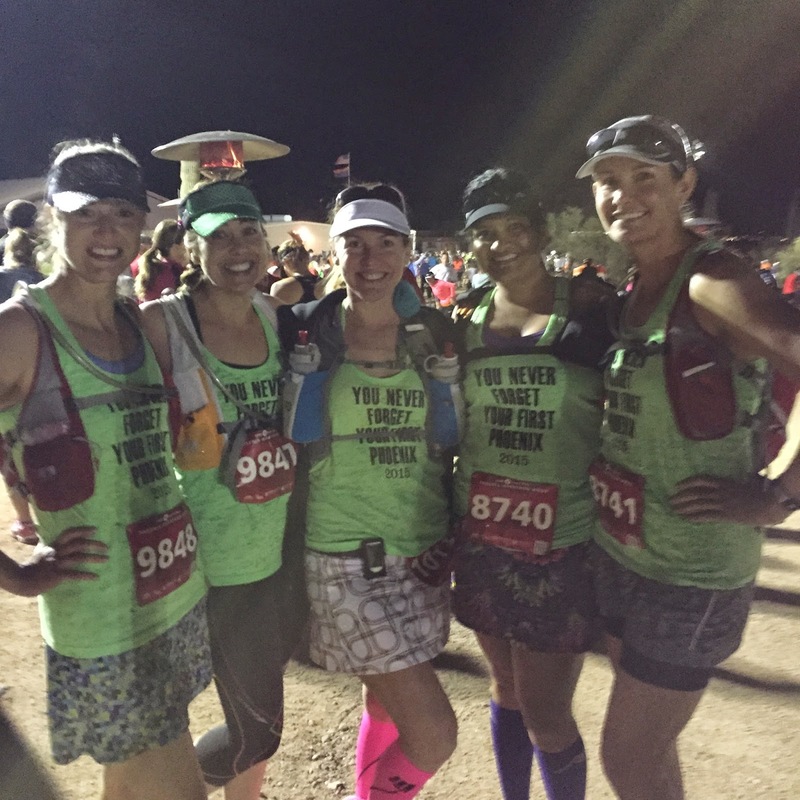 We all picked out our outfits centered around the awesome tank from Run with Perseverance! You can use code PHOENIX15 for 15% off anything at her Etsy store! 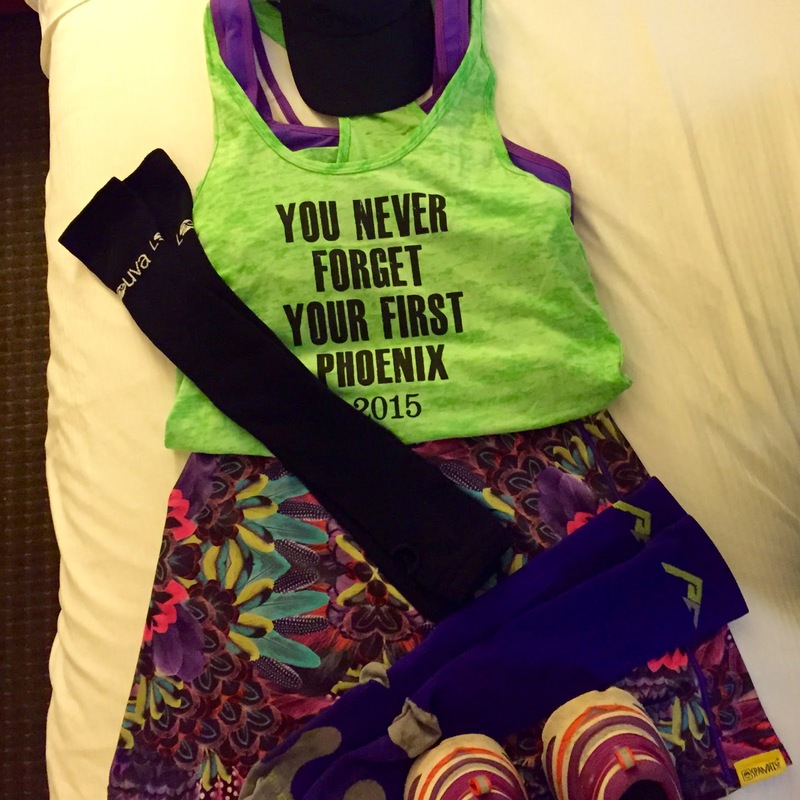 What I wore: Tank, Sports Bra, Sleeves, Skirt, Compression Socks, Visor, Shoes and Hydration Pack. Conveniently, I have a GIVEAWAY going on RIGHT NOW for those sleeves here! After waking up at 3 and getting out of the hotel by 4:00AM, we made it to the finish line to take the shuttle to the start line. I wasn't thinking about all that as I was breathing in the ash and looking at the fireworks. I was checking out the cacti and thinking, "Photo Opp!" Saw a ton more awesome friends too! 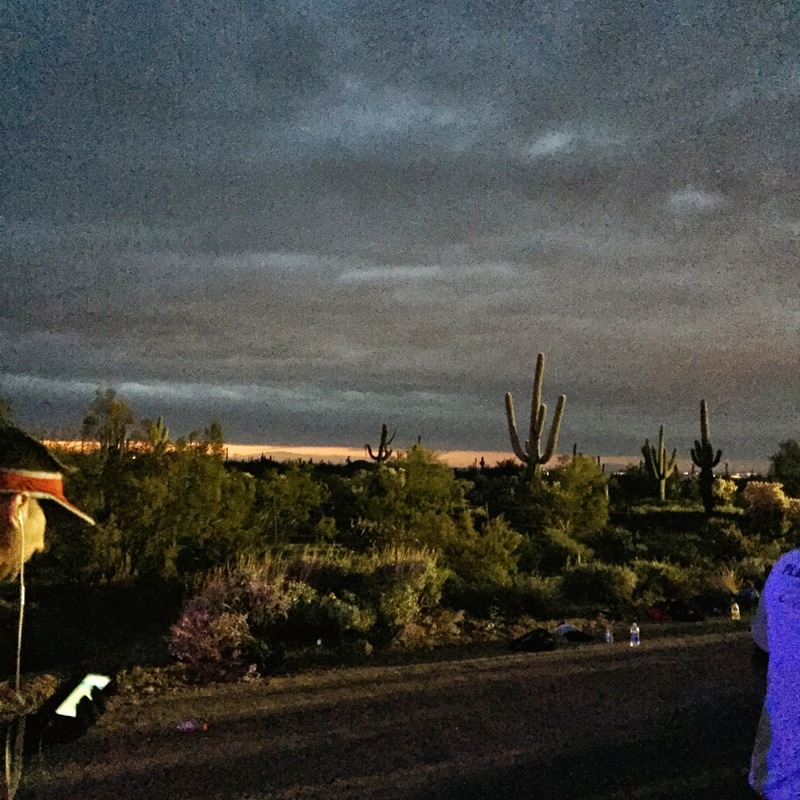 We then headed over to the start line and saw this morning sunrise view! Who knew AZ was so picturesque?! And we were off! Let's take a look at that course again. The first 4 miles were a gradual downhill. And then we were in for a rude awakening when the next mile and a half was a gradual UPHILL! Say what?! At this point, Jamye took off like the Energizer Bunny she is. Jenn, Thia and I stuck to our plan of stopping at every aid station walking 10-30 seconds each time. This whole time, there was wind. Strong wind! It seemed that every time the course would go uphill, the wind would smack us in the face. I trained for almost every condition but I didn't train for wind! UGH! Then we made it to the Halfway mark! And that is where my troubles began. I stopped being able to breathe. I just couldn't do it. My lungs were hitting down and I knew this was how people die during these races. I couldn't decide if I should call my husband in San Diego and tell him I love him. It was that bad. My vision was blurred and my lungs burned. We walked almost all of Mile 14 and most of 15. Thankfully, Thia is a yoga expert (yogini?) and helped me breathe thru my difficulty. Up until this point, we were well ahead of the 4:55 pacer and we (I) thought we had the sub 5 in the bag. But it is hard to run continuously when you can't figure out how to catch a full breath and having a mild asthma attack. At Mile 18, the pacer caught us and passed us. But I saw this friendly face. 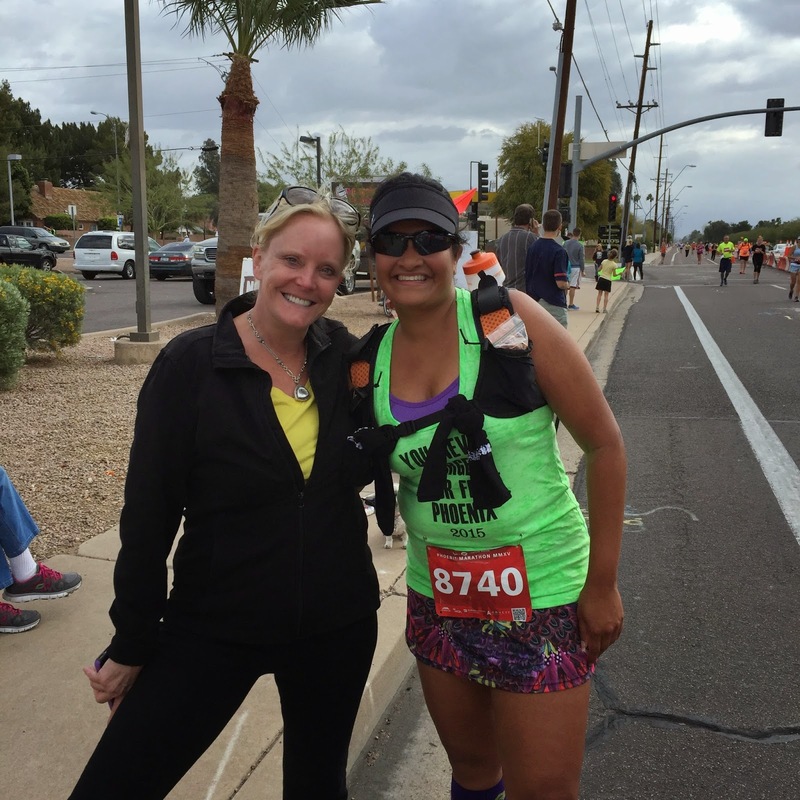 My friend Lisa even came to meet us at the finish line. She rocks! So we kept on going. My body started to completely fail me. Even while my lungs were screaming for more air, my left foot started cramping. But thanks to Jenn (amazing coach Jenn I might add) and Thia, we made it to that finish line. Thank you Corine for this picture! You rock! And we earned our medals. Let me tell you. Every minute. Every mile. Every darn breath. This time, with Erica and Suz too! I can tell you that I didn't fully regain breathing ability until Sunday evening on the drive back to San Diego. Imagine! My last asthma attack before this one was 2003! 12 years ago! But I earned this thing! 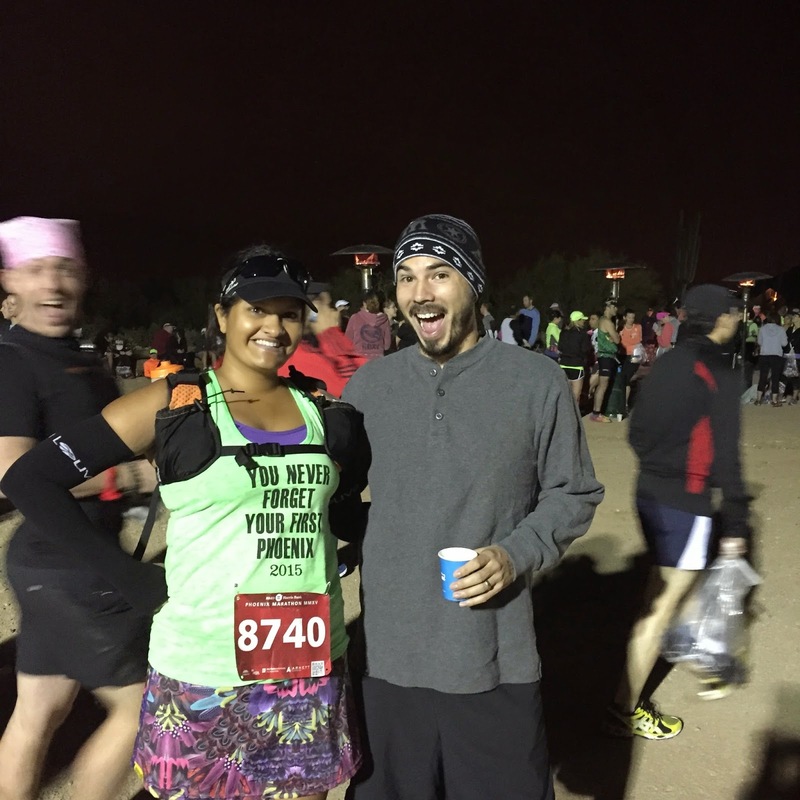 In the very near future, I have a post planned about what I learned doing / during my First Marathon and the answer to the question, Will I Do Another? 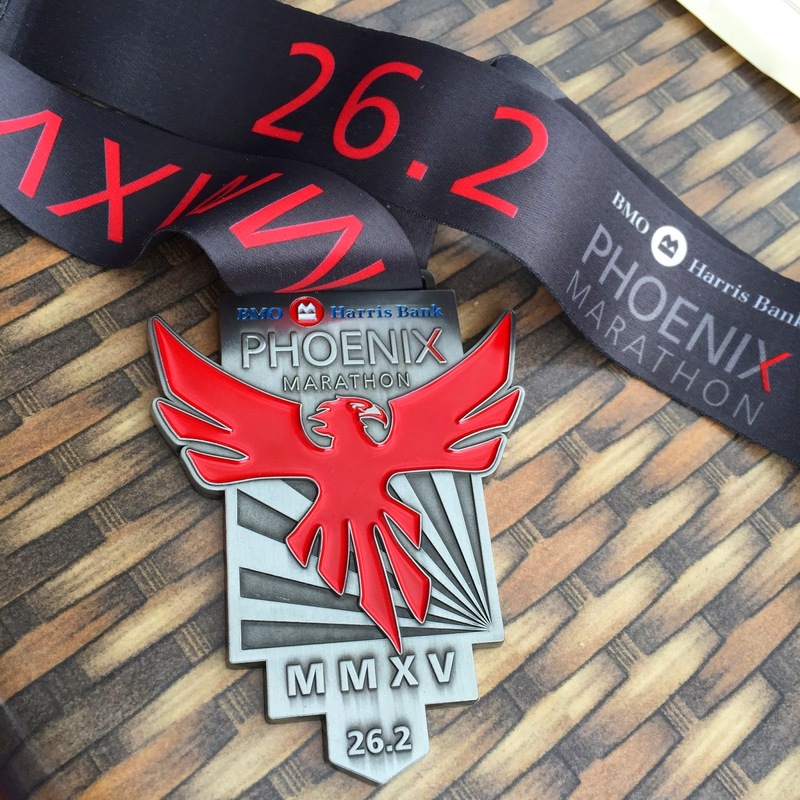 I should also do a post on what I ate while in Phoenix and during the marathon. Thank you for taking the time to read this! It means a lot. 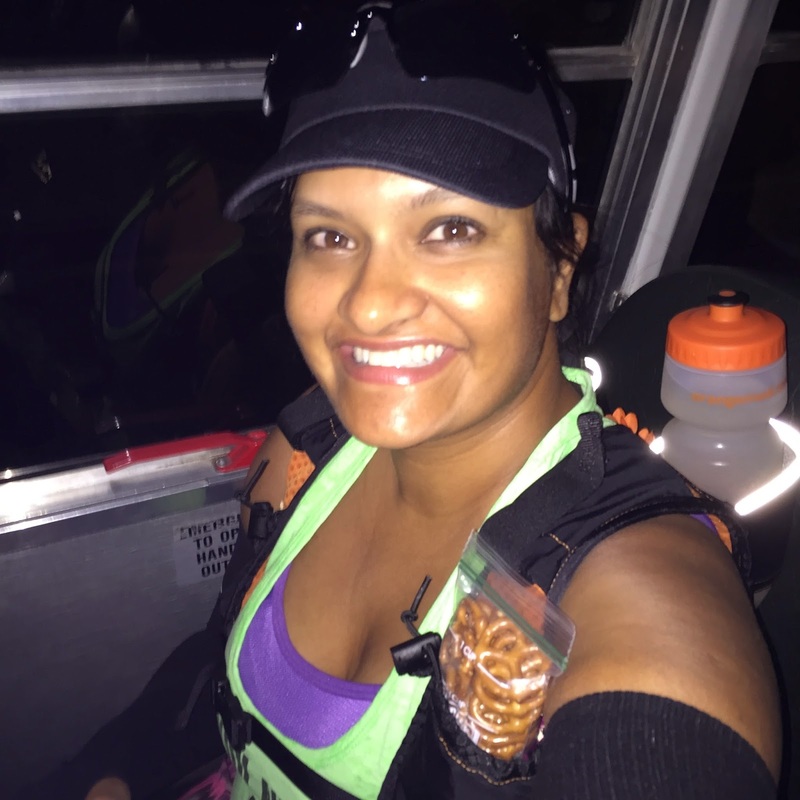 Thank you for taking the time to check on me and encourage me along every step of this marathon training process. 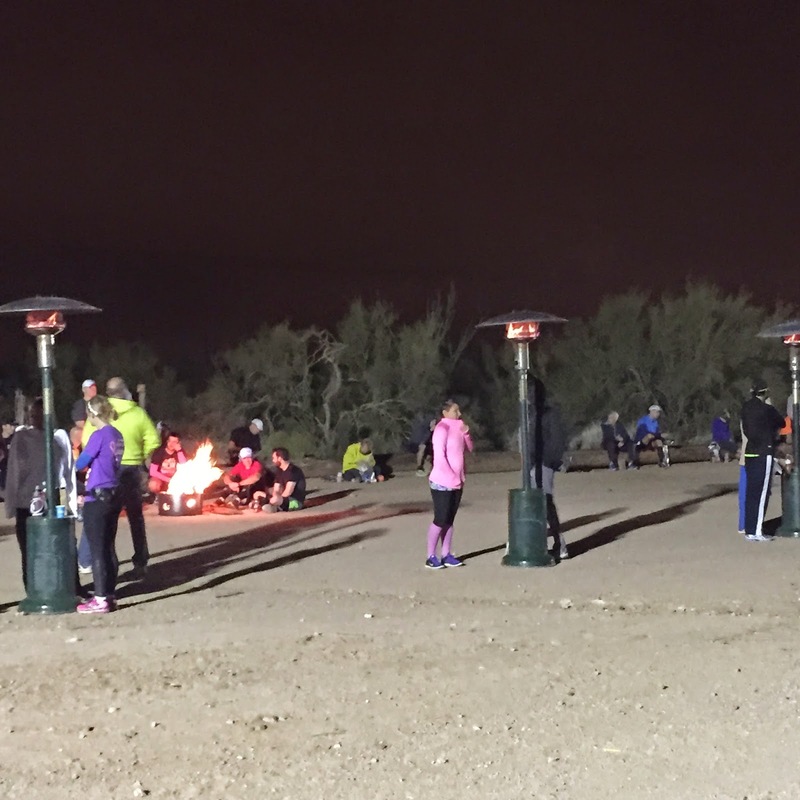 Runners are incredible people. The kindest and most giving and most encouraging souls of anyone I know. So thank you. From the bottom of my heart because apparently, the bottom of my lungs is not enough! Congrats on your marathon! I lived in Arizona as a kid and the countryside can be beautiful. The start of the race was breath taking ... in a good way! Sorry to hear that you had difficulty breathing - I can only imagine how scary that must have been! But so proud of you for pushing through and completing your first marathon - such a rock star!! Thank you for every single encouraging word along the way! So so so so proud of you on so many levels. I am so honored to have been a part of this for you!!! So pumped we finally got to hug it out! Yay! Congrats. You really did earn it. Be proud! Congrats.....you must have been ecstatic to finish....I know I was when I ran my first 13.1.....I have never attempted or even thought about attempting a full. ;-) I am curious as to if/when you may do another. HUGE congratulations on your first marathon. Its the absolute best feeling in the world and you struggled through a hard race. Bummed I didn't see you there! Thank you! And with this lame injured foot, I am sidelined for a bit! SO MANY BLOGGER FRIENDS! Way to go, lady! Congrats! It was so much fun seeing everyone! Oh my gosh my lungs hurt just reading this. 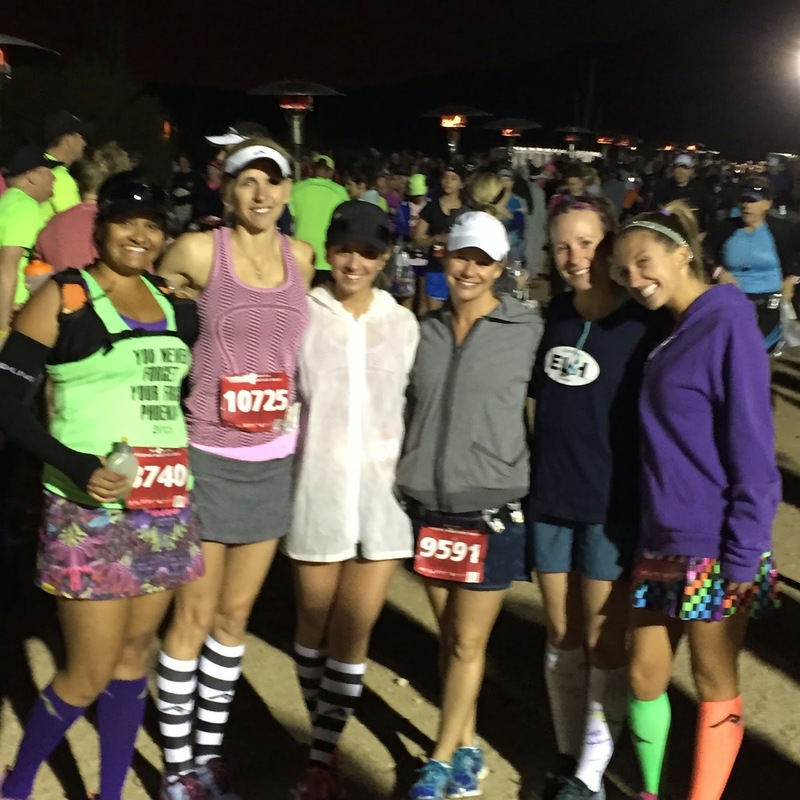 It's so cool that you had a goal, trained with total discipline (and fun) and conquered it! 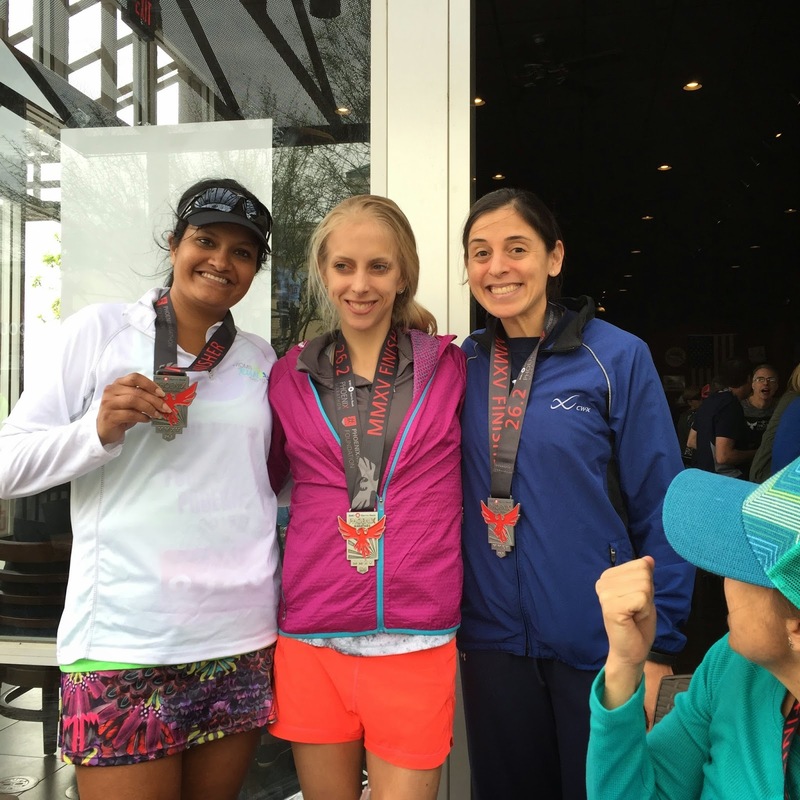 Congratulations to you Smitha! 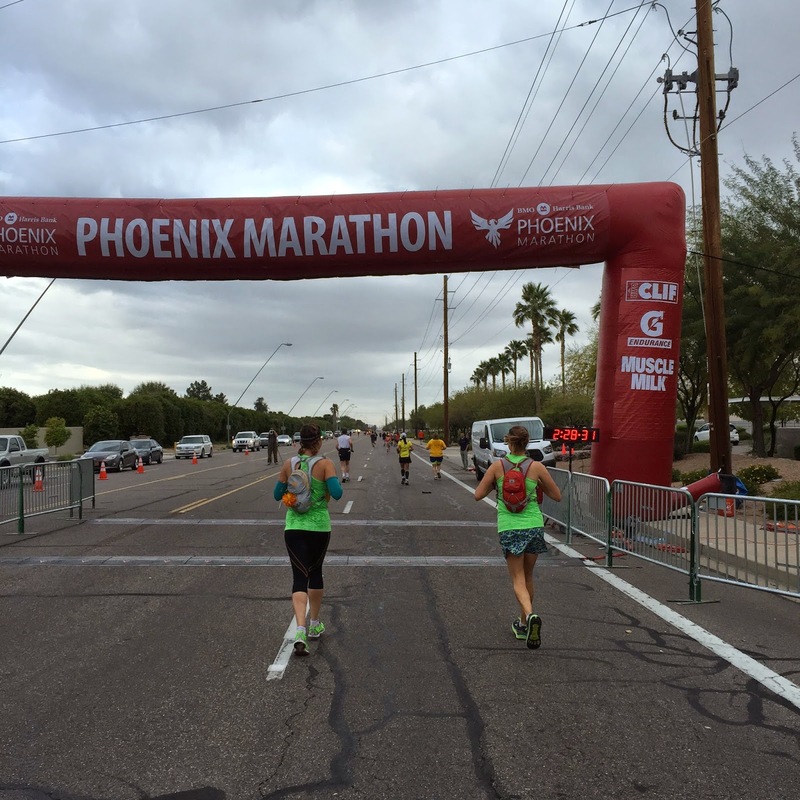 You are a rockin' Marathoner!! Wow, congratulations on your first (and hopefully not last!) marathon! Way to pull through even with all the asthma issues, I can't even imagine that! Who knew I would have to carry an inhaler 12 years later?? First of all, congratulations on your first marathon!! I'm so sorry that you had to deal with some asthma issues. Was this the first time you've had a flare up during training? What do you think was the cause? So proud of you for pushing through it and fighting for what you had trained so hard for. Great job mama! I am sure it was those darn bonfires coupled with the super dry air! Great job! Sorry to hear about your troubles, but you persevered and earned your medal. It was fun reading and following your training. You've given me confidence in my own training! Whoop whoop! Congrats! YOU can do it! YES! Congrats marathoner! Sorry to hear about your asthma attack, but way to go on pushing it through without compromising your health. Thank you for all your support along the way!